The good news – we have the technology and solutions today to address climate change and create a safe and healthy future. And they are affordable. The primary cause of climate change is burning fossil fuels for energy – coal, oil and natural gas. To address climate change we need to transition to new, clean renewable energy sources. Renewable energy technology is not only available, prices have dropped so much in the last few years that it is now equal to or cheaper than fossil fuels in many parts of the U.S. By 2020 renewable energy technology will be cheaper in most if not all of the U.S. The better news – this transition does not need to turn our lives upside down! This does not require walking everywhere and only eating granola. We can maintain a good quality of life in this transition. Better yet, transitioning away from fossil fuels to renewable energy will also improve our health, save money and create jobs. Learn more about these benefits and the how we can transition from fossil fuels below. The most important step is switching our electricity to clean, renewable power sources like solar and wind energy. This will not only help with climate change, it will also improve our health and reduce energy costs. Prices for renewable energy have dropped significantly in the last few years and will continue to drop, lowering energy costs for families over time. Battery technologies are also developing rapidly and will soon provide a low cost way to back up the energy from solar panels or wind turbines and save it for when we need it - when the sun is not shining or the wind is not blowing. Clean renewable energy sources also don't create harmful emissions that cause air pollution and will create cleaner and healthier air. The next step - switch to using electricity for our energy needs. 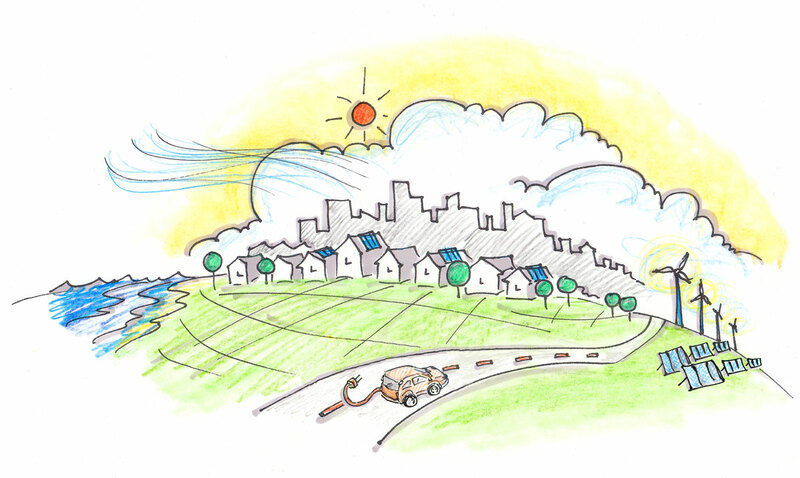 With clean, renewable electricity, if we transition to electric transportation and using electricity to heat our homes and businesses, we will have successfully made the transition away from fossil fuels. And it doesn’t need to turn our lives upside down! If you drive a car, this means going electric the next time you are ready to buy or lease a new car. Not ready to drive an electric car yet? No problem. But did you know electric cars are much cheaper to operate and (the best secret) they are fun to drive! Blow away the muscle car next to you at the stop light with the instant torque of an electric car. In 2017 battery ranges will start to increase, with some models over 200 miles per charge, and prices will drop over the next few years making electric vehicles a viable option for most people. Check out the Electric Car action to learn more! For non-car options, this means electrifying public transportation like electric buses and trains and expanding alternatives like increasing bike paths. The second part of step #2 is transitioning to electricity and away from natural gas for heating our homes and businesses. This means when our water heaters and central heating units are ready for replacement, installing new energy efficient electric models. These electric units are highly efficient and can save households significant money on energy costs over the lifetime of the equipment. Just bought a new water heater? No problem, schedule this action on your list 5-10 years out when you are ready for a replacement. The last step is to be efficient and smart in our energy use. This will reduce our total energy needs, making the transition to clean renewable energy sources more rapid and cost effective. It will also help to lower the amount of fossil fuels we burn while we transition. Being energy efficient does not mean restrictions like setting our thermostat to 50 degrees – it means using reasonable settings and installing a smart thermostat to make sure the energy is on only when we need it. Best of all, being energy efficient saves money. Many energy efficiency actions pay for themselves after just a few years and then lower home energy costs significantly over time. There are also more financing options becoming available to help with energy efficiency upgrades. Check the action pages for financing resources. 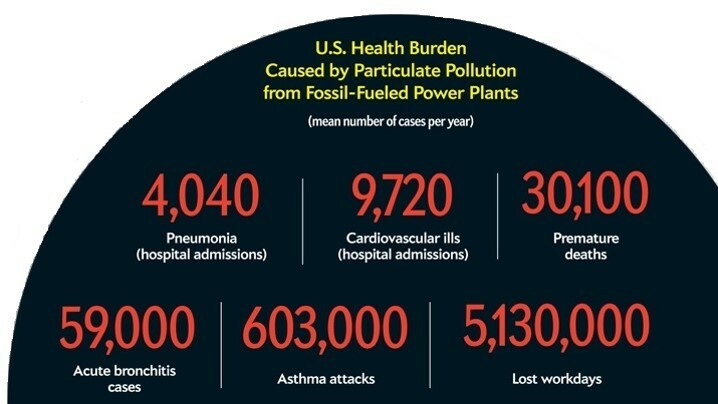 Burning fossil fuels has very serious health impacts. Burning coal, oil and natural gas creates smog and other air pollution that cause serious health conditions including asthma, bronchitis, heart conditions, pneumonia and even premature death. If we stop burning fossil fuels, we will remove these dangerous pollutants and significantly improve our health. Imagine no more smog! The annual health impacts are significant as can be seen in the infographic to the right. The cost of these health impacts is also significant and having a serious impact on family budgets, businesses and the economy as a whole. If the health costs of fossil fuels were included in the price of fossil fuel powered electricity it would make renewable energy sources extremely cheap in comparison. Add in the costs of emissions from cars and trucks and the health costs are significantly higher. 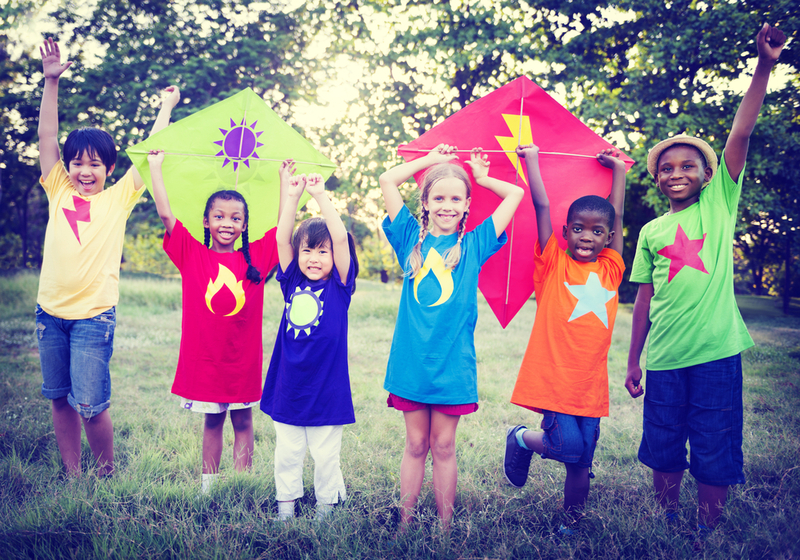 Transitioning away from fossil fuels will create a much cleaner and healthier environment for our children and our future. Renewable energy will lower our energy costs over time. 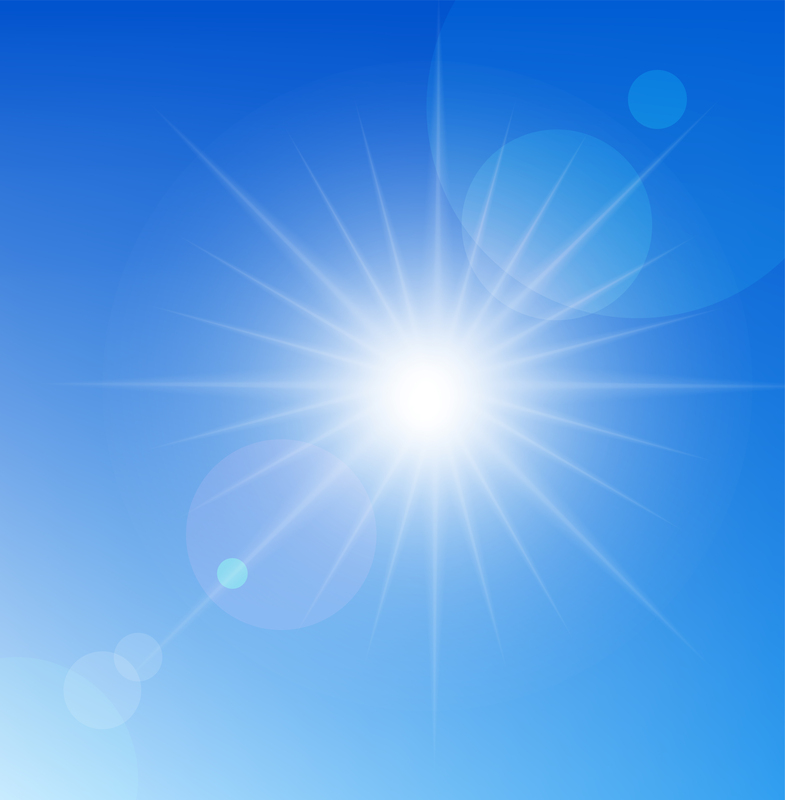 Think about it – the sun provides, free, clean energy every day, far more than we could ever use. There is no cost to extract it, refine it or transport it. Once the solar panels or wind turbines are installed, they provide very cheap, clean energy for a very long time. 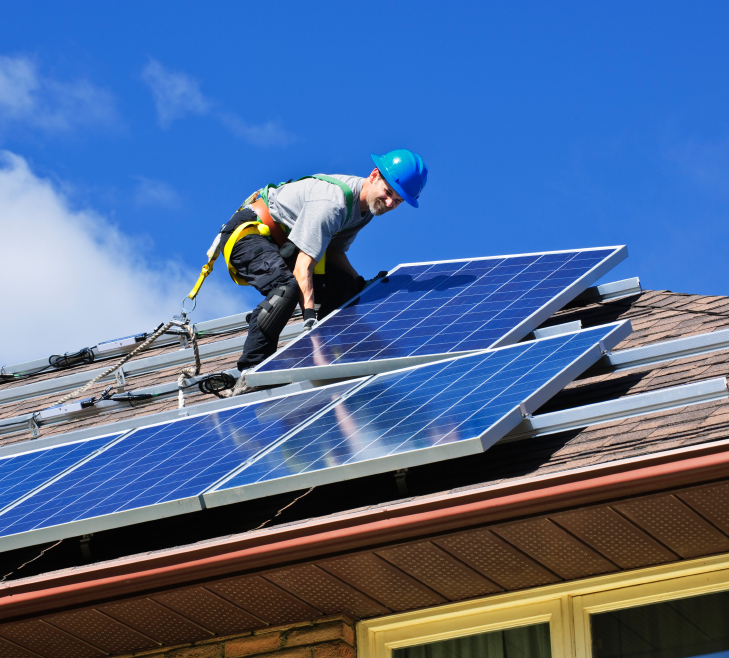 If you invest in solar panels for your home, once you pay off the initial investment over 5-10 years, then the power you generate from your panels is free for the lifetime of the panels. With a lifetime of generally 25+ years, that's a lot of free energy! It works the same for renewable energy at larger scales, once the initial cost to install a large solar field or wind farm is paid off, the cost to operate is extremely low. Over the long term, renewable energy can significantly lower energy costs to families across the U.S.
Fossil fuels on the other hand are expensive to extract, refine and transport - and we are running out. There is only so much fossil fuel in the ground. Although we are currently experiencing an unusual period of low prices, this will likely not last. Fossil fuel prices are projected to continue to rise dramatically in the future. Prices for renewable energy sources, on the other hand have dramatically decreased in recent years and will continue to drop. The faster we transition, the more we protect ourselves from future fossil fuel price shocks. The transition away from fossil fuels will require manufacturing and installation of renewable energy technology, electric vehicles and buildings retrofits. All of these create jobs. Better yet, they create U.S. jobs. The manufacturing and installation of solar, wind and other renewable energy equipment is one of the fastest growing industries in the U.S. 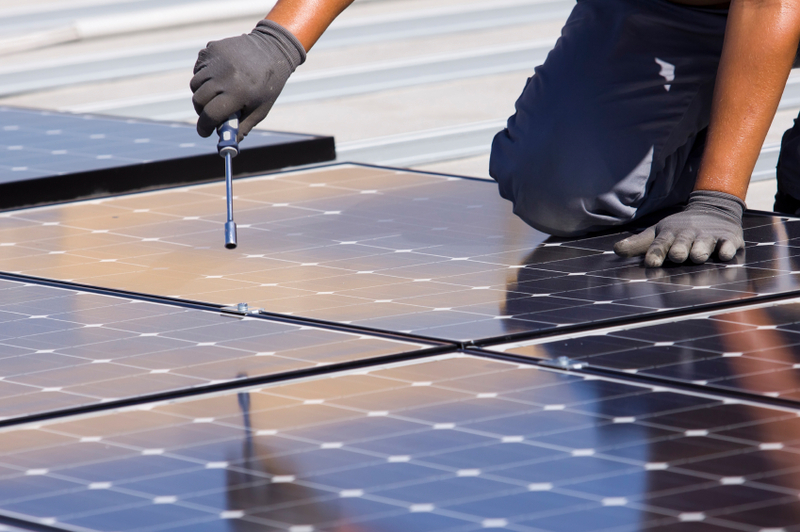 The solar industry alone has created more than 100,000 new U.S. jobs in the last 5 years, which represents job growth 20 times higher than the rest of the U.S. economy. This is just the beginning with a potential for far more jobs in the future. Building retrofits to increase energy efficiency and the installation of high efficiency electric heating units will also create thousands of local, U.S. jobs. With a global commitment in 2015 from 196 countries to transition away from fossil fuels to clean energy, the market and demand for renewable energy technology is projected to grow exponentially in the coming years. The U.S. has the opportunity to be at the forefront and lead the industry, creating significant opportunity for new investment and jobs in the U.S.
Renewable energy technology is different than the technology we have used in the past to power our electricity. Renewable energy technology works at any scale - from panels on the rooftop of a family home or a large solar installation. This means that families, communities and small businesses have the opportunity to own their own solar panels and receive the financial benefits of cheap renewable power. This puts the opportunity for ownership and the financial benefits back in the hands of families and the local community. With battery prices expected to decline significantly in the next few years, soon a home battery backup will be cost effective. This will allow for even more individual control and independence over our energy needs. The transition to renewable energy will reduce our reliance on foreign oil, improving national security. Renewable energy technology does not require fuel, once the equipment is installed it runs off energy from the sun. This removes the need for foreign oil. However, there is an even larger benefit in transitioning away from fossil fuels - reducing the impacts of climate change around the world. Drought, reduced crop yields and water shortages are all impacts from climate change that many areas of the world are seeing now. This can lead to increased tension over resources. When these conditions are present it can increase the likelihood of instability in countries. 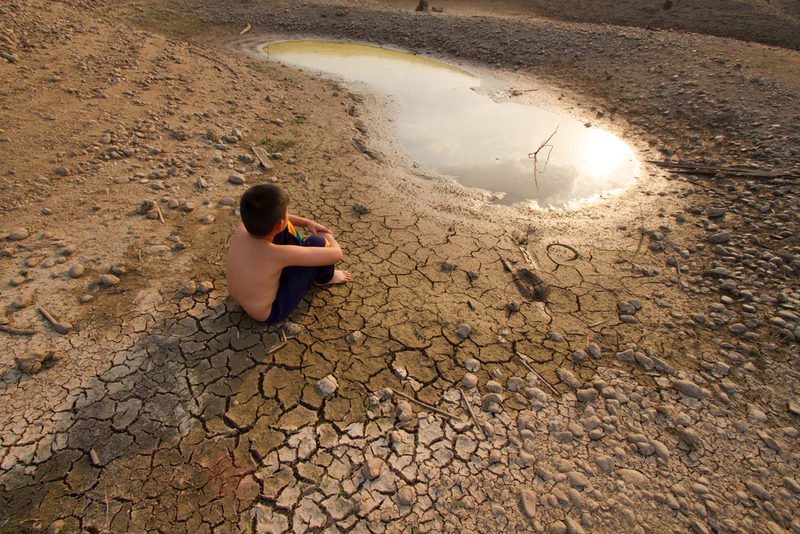 Climate change is one of the factors in the conflicts in both Sudan and Syria. The sooner we transition to clean renewable energy sources, the lower the impacts will be, creating a safer world. All of these benefits - cleaner air, lower energy costs, more jobs, community benefits and a safer world, all come from this transition away from fossil fuels to renewable energy. There are so many reasons why this transition is not only important, but will lead to a better future. In addition to all of these reasons, there is one more - being good neighbors. As mentioned on the Climate 101 page under the FAQ (What about China? ), the U.S. has the largest responsibility for climate emissions over time. From the time we began to burn fossil fuels to now, the total emissions are higher for the U.S. than any other country. Yet, the countries that will be hit the first and hardest with climate change are those with very few resources. Just as we come together as a community in our city, working with our neighbors to reach community goals, we should also consider how our efforts will help to lessen the impact on our neighbors around the world. We have the biggest impact, but we also have the biggest opportunity to make a difference in the future not only for our children, but for children all over the world.